Setting up successful violin lessons for your child, or for your students, involves more than simply scheduling a lesson time. It will be a while before you can play a piece. You will have to practice. But how to get those ideas across, in a way that everyone truly gets the message? The Suzuki community does a great job of encouraging teachers to hold parent orientation meetings so that parents can understand what their responsibilities will be and also explain them to their children. Especially when teaching a very young child, a parent plays an important role. Some teacher trainers even advocate a private parent-teacher conference time where the parent pays as if it were a normal lesson. These suggestions are wonderful, IF you can get parents to attend meetings and if you have the confidence to ask parents to pay for a meeting that is not a “lesson” for their child. Sometimes, though, the orientation meeting doesn't happen, for whatever reason. Or, even with the orientation meeting, families still don't fully understand what to expect from violin lessons, and in the case of Suzuki lessons, group classes. A few years ago, I had an idea that if I wrote a series of children’s books about life as a Suzuki family, then children and their parents could read them together and learn about the process as a family. They are available through the Suzuki Association of the Americas. What parent would decline a child’s request to read them a story, especially one with great pictures (thank you to my Dad for his wonderful artwork). 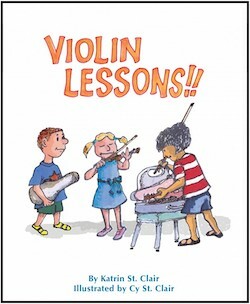 I found that if I gave this book to families that inquired about violin lessons, they came into the first lessons understanding my expectations for them. The children were mentally prepared. The families knew which materials to bring and were ready for the establishment of basic techniques. Before the books, I had families assume that they would show up with a violin and start playing music the first day. While parent meetings are wonderful and the ideal, my hope is that teachers who struggle to get parents to engage can reach them through this book. There are two more books in the series about the young student who begins lessons- “Solo Recital” and “Summer Institute”. These are soon to be published and I am excited to introduce my new students to the fun of performing and attending music institutes in a child friendly way.